Kusadasi, a lovely port town on the coast of Turkey that many cruise ships dock at, is the gateway for visitors to Ephesus, largest city in ancient Asia Minor. Located 3.6 miles from the Aegean Sea, the governor of Rome resided in Ephesus. Geography was as important to its history as were politics and religion. For more than 3,000 years, people have been making pilgrimages to the Temple of Artemis, Greek goddess of motherhood and protector of flora and fauna. Other sacred sites included Cave of the Seven Sleepers and House of the Virgin. The stadium where sporting events were held and where St, Paul preached. For Christians, touring Ephesus is an important adventure. As Christians, our walk through Ephesus, with a guide identifying specific landmarks, was almost surreal. It was mind-boggling to think about all the Biblical activities that had transpired at the very place and in the same streets as we were walking centuries later. 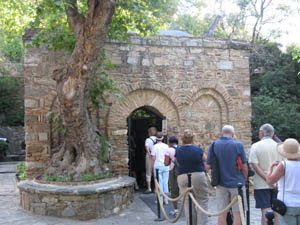 Visitors entering Mary's house near Ephesus. Saint Paul, the Apostle, lived and preached here. The disciple John brought Jesus’ mother Mary here to live in peace after the crucifixion. We visited her home on a hill near the city, sipped holy water from a nearby spring, and added our wishes to the prayer wall. Ephesus is also where John wrote his gospel, now part of the New Testament. During the Roman era, Christianity was legalized, and a beautiful church, Basilica of St. John, was eventually built over John’s tomb. Ephesus was an important archeological site since it contains the largest collection of Roman ruins, many quite identifiable. These have been pieced together to provide a good picture of life in ancient times. About 250,000 people lived in Ephesus during its heyday. It was a gathering place for skilled artisans and rich merchants. Some statues are very well preserved. The city was destroyed in 263 A.D. and later rebuilt. But over several centuries the harbor filled with silt, which halted trade and eventually led to abandonment of the city. More ruins the have been restored in Ephesus. Excavation began a century ago, and restoration has been under way for almost two decades. Walking the dusty streets of ancient Ephesus, we admired this historical treasure and marveled at the well-preserved remains from the city. Entrance to stadium at Ephesus. 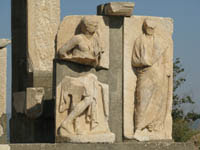 Among the most notable were the stadium where sporting events were held, the baths and pool on well-delineated Harbour Street, the marble road leading away from the great theater of the city (where Paul preached to thousands of people), Temple of Hadrian, public toilets and brothel, Church of St. Mary, and numerous fountains statues, columns, gates, and houses. 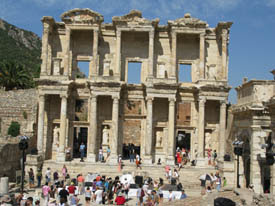 Library of Celsus is one of the best preserved sites in Ephesus. The Library of Celsus is one of the most beautiful structures in Ephesus. Built in 117 A.D., it was a monumental tomb for Julius Celsus Polemaeanus, governor of the province of Asia. The grave of Celsus was under the ground floor, and a statue of Athena, goddess of wisdom, was near the entrance.